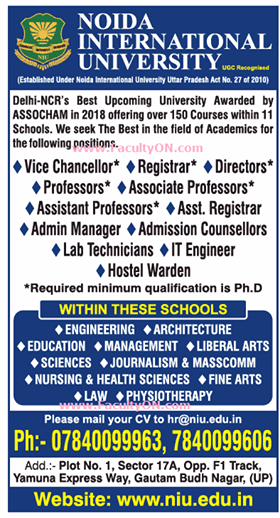 Noida International University, Gautam Budh Nagar has advertised in THE TIMES OF INDIA newspaper for the recruitment of Professor/Associate Professor/Assistant Professor jobs vacancies. Interested and eligible job aspirants are requested to apply by earliest. Check out further more details below. About College: Located in one of the most promising economic districts of the country and situated in NCR Delhi, the Noida International University (NIU) offers infinite opportunities for self motivated individuals for their intellectual, personal and professional development.